This week’s photo challenge asks us to share a surprise on The Road Taken. Imagine my surprise when we saw ocean waves in the Mohave Desert on Hwy 395. Well, OK, not real waves, but clouds that look like waves. Have you ever seen anything like this before? We visited some windsurfer friends who live in Helendale, California on Silver Lakes. 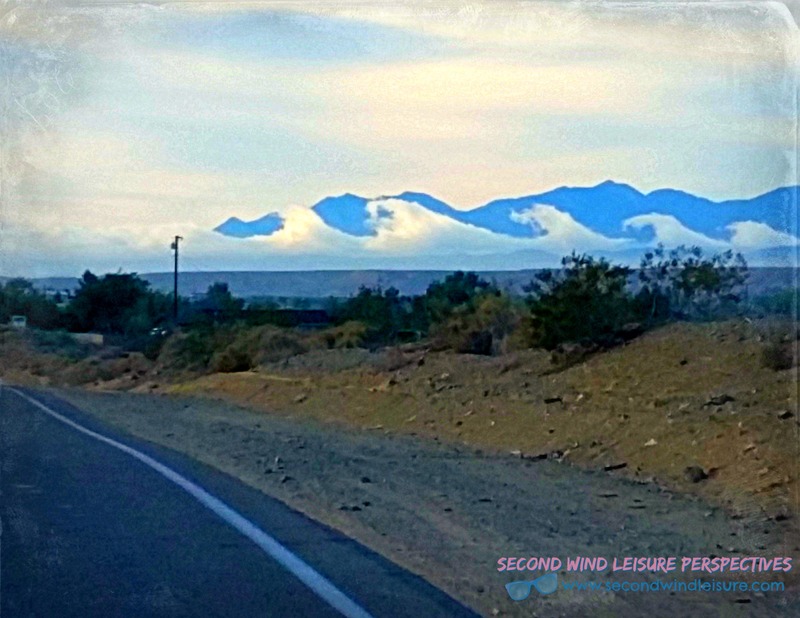 Perhaps the clouds were taunting our late Fall adventure in the desert with a future forecast of the waves to come when windsurfing season starts in April! That picture reminds me of the drive from San Diego to LA. Just gorgeous! Hi Gary, thanks! Looks like you are playing catch-up on my blog today 🙂 Appreciate your visits! I thought where does the Mohave Desert meet the ocean. A strange phenomenon. I agree with Robjodie. This stunning photo is definitely contest -worthy! Eeek, you guys are too nice!! That is an extraordinary photograph, literally something out of this world. What a serendipitous moment for you and so fortunate you had your camera. Thank you, Sharon, I’ve been waiting for this chance to share it, too! Just for fun crop out the highway in the bottom and see if you like the panoramic effect!! Great capture by the way. That is amazing! We had some odd cloud formations around here recently, but nothing like that! Lucky capture (especially since you said that they just lasted a little while) – right place, right time, camera at the ready! This is a first for me! Great capture!! Me, too! Thanks so much! Terri—that’s so amazing!! You should enter this into a photography contest!! Wow, beautiful! I have never seen anything like that before.